Layoffs on Wall Street plunged in January following a surge the prior month as financial services executives remain cautious due to weak trading revenue, poor IPO volumes, and increased regulations. According to the January Challenger, Gray & Christmas Job Cuts Report released last week, the financial services industry saw planned layoffs plunge 80.7% to 998 layoffs from the unusually high 5,177 layoffs announced in December. As a result of this drop, the January 2016 layoff figure remained 81.4% below the 5,375 layoff total reported during the same month last year. New hiring remained extremely weak in January as financial services firms announced that no new jobs were available, following a modest 950 new jobs openings that were announced in December. The poor January 2016 new job opening total was the lowest monthly total since April 2015 and compares to 200 new job openings that were announced in January of 2015. As you can see from the above chart, the layoff and new job opening data is extremely volatile on a month to month basis. However, what is clear is that monthly layoffs have trended between 500 and 5,000 over the past two years, whereas new job openings have bounced below 3,000. 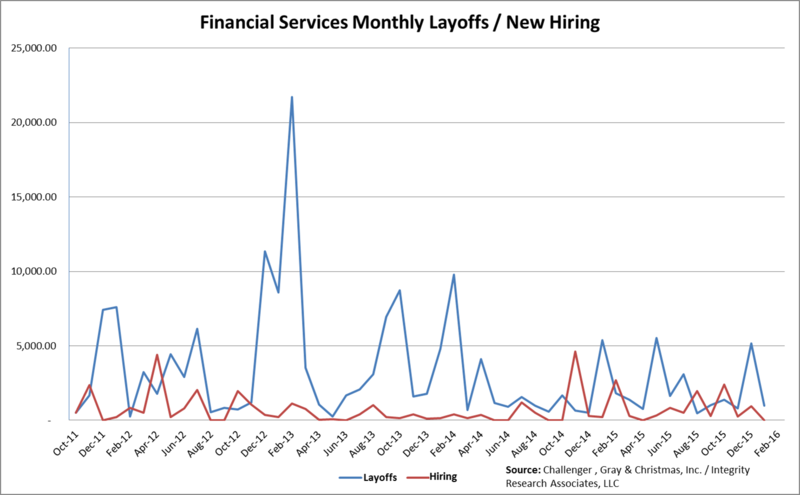 What is also obvious from the above chart is that financial services employment has generally been contracting over the past five years as layoffs have consistently trended above new job openings. During January, Goldman Sachs said that it was planning to cut up to 10% of its fixed-income traders and salespeople later this quarter, a move that could impact up to 250 employees. This reduction is larger than the regular 5% first quarter pruning which normally takes place at the global investment bank. Wells Fargo also announced that it is planning to eliminate 121 technology jobs across the bank’s operations nationwide as part of an efficiency initiative. These layoffs are the latest effort by the Charlotte-based bank to reduce costs at a time when low interest rates have had a negative impact on revenue growth. Birmingham, Alabama-based Regions Bank announced last month that it plans to lay off 260 employees company-wide “as part of an effort to improve efficiency and restructure the company’s expense base…” The job cuts are expected to take place during the first quarter of 2016 and would be in a number of different departments and offices. The layoffs represent just over one percent of the company’s workforce, King said. Although Wall Street layoffs dipped sharply in January, this is clearly not a signal that banks and brokerage firms have stopped rationalizing costs and are looking to staff up as they have in the past. As we have mentioned previously, weak equity and fixed-income commission revenue, a slowdown in IPO volume, and increased regulatory pressures continue to squeeze profits. Consequently, we expect that managers at sell-side research departments and independent research firms will be wary of aggressively expanding the ranks of their analysts and salespeople. Of course, we think most firms will replace staff that have moved on, and some might even try to expand coverage of strategic sectors like biotechnology. However, we doubt that research industry executives will suddenly get bullish about adding to their expense base unless it becomes clear that revenue is on an extended upswing. Unfortunately, we don’t believe this will take place any time in 2016.